Start the night off right! Wet Entertainment proudly presents Bangkok’s #1 pre-party, The Bold & The Beautiful, at Koi restaurant and lounge. Featuring hot beats, great drinks, and Bangkok’s sexiest party people! 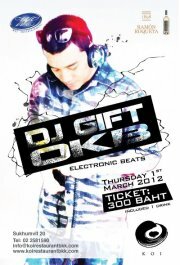 This week we bring you Bangkok’s own DJ GIFT from the world famous OKB (Original King Beat) crew. He will be bringing you a dance inducing set featuring the best in hip-hop, house, and mash-up! Marvel at the beautiful dancers, jam to the music, and take in the high energy scene while you sip delicious cocktails and dine on savory sushi. Be Bold, be beautiful, be seen at Koi Lounge this Thursday!